badly on the subject of Freddie Mac, his ethics scandal when he was speaker, and other weaknesses. I had exactly the opposite reaction. If you already know the facts about the ethics scandal, then you’ll think Newt floundered. If you don’t — and I think this describes about 95% of the audience — Newt’s explanation either (a) sounded OK or (b) muddied the waters enough that you came away thinking it was just routine campaign sniping. Besides, it was 15 years ago. Romney really needs to have a clearer, sharper attack on the ethics charges if he expects this to stick. 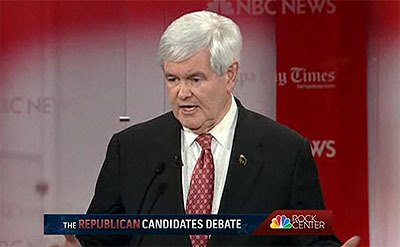 What Monday demonstrated  is that Newt’s reputation as a brilliant debater is actually a fraud. What Newt has done well isn’t debating the other candidates; what he’s done well is attacking the moderators, and it works especially well when there’s a partisan Republican audience ready to cheer any shots at the liberal media. That’s not going to happen in general election debates. More broadly, he’s quite good at using language designed to appeal especially well to Rush Limbaugh listeners: Chicago-style politics, Saul Alinsky, teleprompters, and more. Terrific, again, for provoking a big reaction from a partisan audience of intense, highly-informed conservatives. Utterly useless in general election debates. Yep. Newt’s sneering, condescending tone is pitch perfect for the tea party crowd, but extremely off-putting for the less partisan folks who will determine November’s results. And without that, Newt’s got nothing. He doesn’t really do any better on substance than Romney or any of the others, and he certainly doesn’t have any native charm. If he tries to take his sneer on the road in a general election, he’ll be no more successful than Rick Perry was at trying to transplant his Texas-style campaigning to a national audience.